We’ve hit a turning point in the history of Radio Free Brooklyn, and a new beginning for the station. We’re sad to leave our first home at 1345 DeKalb, but, don’t worry, we’re still proudly Bushwick. The new studio, located on the 1st floor of the premier coworking spaces at 100 Bogart, will provide an amazing home for on-air operations replacing our inaugural studio space at 1345 Dekalb. For listeners, it is business as usual for the live RFB stream and secondary music stream RFB 2: Local Chords. 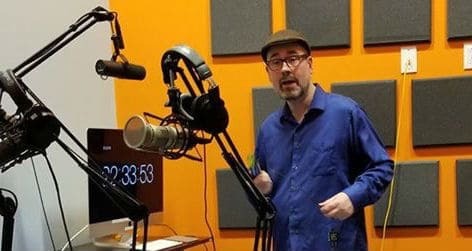 The 2 ½ -year-old network transmitted its final live show, BEN Talks on Thursday evening and will began live broadcast in the space at 100 Bogart on Friday morning with Aural Medication at 11:00 a.m. This partnership will enable Radio Free Brooklyn to continue to grow and provide a platform for artists, journalists, musicians and community members to share their talents with Brooklyn and the world by creating a space for community freeform internet radio to thrive. And, by partnering with 100 Bogart, co-working space members will gain access to additional resources such as podcast recording, and other crossover services in the near future. Radio Free Brooklyn also celebrates the launch of 15 new shows featuring an eclectic mix of talk and music programming. Coming later in December, RFB will kick-off its series of music performances called RFB Presents, featuring local live music. “We are thrilled to begin this new phase in the journey of Radio Free Brooklyn, and are excited to grow our relationship with 100 Bogart in service to the people of Bushwick, Brooklyn and beyond,” says Tenney.